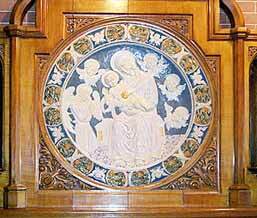 Della Robbia plaque - 36" (914 mm) diameter. 1898. The Della Robbia Pottery, a relatively short-lived venture existed between 1894 and 1906. It was set up in Birkenhead, near Liverpool, by Conrad Dressler and Harold Rathbone, to make architectural wares. Rathbone's ideas on design were in line with the Arts and Crafts movement of the time, and the demand for architectural pieces was never spectacular. Decorative domestic wares were produced to provide a living for the company, and its customers were what we would now call the rich and famous. Goods were sold at prestigious outlets such as Liberty & Co, and were exhibited world wide. Dressler left after three years to start another company, and his place was taken by Carlo Manzoni. Although the pottery was never a commercial success, its wares have for many years been highly prized by collectors.